Looking to up your game? Give one of these 5 poker training sites a try! For many years, players who were serious about learning the best poker strategies and increasing their likelihood for success relied on experience alone to better their games. The poker rules, they knew. It was "trial and error" one hand at a time, with the lessons potentially being costly depending on just how many errors were made during those trials. The rise of poker strategy books and magazines eventually provided another means for players to learn about the game in between their time at the tables, enabling them to learn not only which were the better poker hands to play and odds and probabilities to know, but to become acquainted with advanced concepts like the importance of position, table dynamics, image and player types, and other concepts mastered by those already versed in the game. The advent of the internet brought about a couple of other important developments as far as learning poker strategy was concerned. The introduction of online poker in the late 1990s and its quick explosion in popularity during the 2000s made it possible for many more to play poker for real money — including in the privacy of their homes — than had been the case before. The rise of online poker in turn also helped fuel the growth of poker sites designed to provide poker strategy advice online via articles, discussion forums, and instructional videos. Today there's a multitude of online options for players looking to up their games, whether you're an occasional player of low buy-in tournaments in your local casino, or a full-time grinder looking to be an online poker pro. Online training sites first emerged during the "boom" years more than a decade ago, with some still going strong today and others have emerged to earn a place among the best poker training sites available at present. What follows is a list of five of the more popular poker training sites available today for those looking not just to review fundamentals or learn a few tips to help them in their home game, but those seriously wanting to become full-time, professional poker players. These aren't reviews, but summaries of each site's offerings. All provide introductory content for no charge to give new visitors a sense of what they offer. Phil Galfond's coaching site Run It Once has been up and running since 2012 and describes itself as "the world's leading poker strategy community." Those curious to check it out can do so for free just by getting an account which provides full access to the site's strategy forum where members post hand histories, discuss concepts and theories, and talk anything else poker. On top of that, all members can check out these three free Elite Videos. But it is the site's huge and constantly expanding library of video content geared toward players of all stakes and games that distinguishes "RIO" from other instructional sites. Those willing to invest can choose between two tiers of membership — "Essential" (low stakes) and "Elite" (high stakes). Joining "Essential" costs $24.99/month and gives users access to five new "Essential" videos per week and the 1,500-plus video Essential Library. "Elite" members get all of that, plus nine more "Elite" videos each week, as well as the nearly 2,400-video Elite library at a cost of $99.99/month. Galfond describes "Essential" as geared toward games with stakes under 500NL, with "Elite" directed toward 500NL and up. The line-up of professional players forming the "Run It Once Pro Roster" who have made instructional videos for the site is impressive, comprised of more than 100 different players including Galfond, Ben Sulsky, Jason Koon, James Obst, Daniel Dvoress, Christopher Kruk, George Danzer, Sam Grafton, Jennifer Shahade, Brian Rast, Fedor Holz, Stephen Chidwick, Tommy Angelo, and Ola Amundsgard, just to name a few. Do you feel you have what it takes? Give 888poker a try and battle it out on one of the most popular online poker rooms on the planet. One of the newer poker training sites getting a lot of attention thanks in part to the high profile of founder Doug Polk, is Upswing Poker. Launched in 2015, Polk and Ryan Fee head a list of pros contributing to the site's numerous poker coaching products. Upswing Poker provides at no cost eight "preflop raise charts" designed to improve starting hand selection and strategy (and win rates), a list of 20 "secret" poker rules when playing three-bet pots, and another list of 20 rules for playing flush draws. For a discounted price of $7, they offer the "Postflop Game Plan" that uses videos to help players learn how to categorize poker hands profitably. Those offerings are both designed to encourage players to join the "Poker Training Lab," a.k.a. the "Upswing Poker Lab," which allows access to to the "complete Poker Training Library" of learning modules, videos, and hand charts, as well as access to the site's Facebook group. To join the Upswing Poker Lab requires a $49/month subscription plus an initial $99 sign-up fee, or users can get a discount by subscribing for six months ($299) or one year ($499). Those willing to spend more have additional options under the site's "Advanced Poker Training" heading, including Polk's own "Advanced Heads-Up Mastery" course, a "Tournament Master Class" taught by Polk and Pratyush Buddiga, a course in "Mixed Game Mastery" from Jake Abdalla, and another "Elite Cash Game Mastery" course by Andres Artinano. There's also a separate "PLO Lab" available as well catering to pot-limit Omaha players. These courses require a one-time fee ranging from $299 up to $999. First launched by brothers Allen and Steve Blay in 2007, Advanced Poker Training has evolved into a well-established training site that offers users a somewhat different and potentially more immersive experience than do most sites. At the heart of APT is its "Poker Training Game" that allows players to play online against sophisticated "virtual" opponents in cash games (full ring, six-max., or heads-up) and tournaments (SNGs, MTTs, and "final table"-only). The multi-table tournaments are the most popular among users and can be customized in a variety of ways — you can even play an MTT against 8,000 opponents. The site also features interesting "Beat the Pro" challenges that involve watching a video concerning a particular topic, playing "challenge hands" against computerized opponents, then watching a replay of the hands you played with audio commentary by pros like Scott Clements, Jonathan Little, Mike Caro, Scotty Nguyen, David Williams, and Lauren Kling and others explaining how they would have played the same hands. There's also the "Combat Trainer" providing repeated drills of common scenarios. There's a lot more on APT as well — instructional videos (including ones featuring the last two WSOP Main Event champs Qui Nguyen and Scott Blumstein), various tools, games for mobile devices designed to improve poker knowledge, a blog, a poker forum, and more. There are even periodic "live" tournaments in which APT members can play against one another on the site. Also useful, every hand played on APT is saved and thus available for later review and to be used to produce weekly reports and other data. Creating an account on APT is free, and allows access to some of the beginning level Poker Training Games. Full membership is $39.97/month, though that price can be cut in half to $19.97/month for those signing up for a year. Started in 2010, Tournament Poker Edge is a little different from other sites in that it focuses exclusively on multi-table tournaments. The site features over 1,000 training videos, with at least four new videos produced each week. Members additionally have access to pro blogs and strategy articles and the member forums. There is also "Tournament Poker Edge University," a full "curriculum" of videos, articles, podcasts, and quizzes designed to help players find trouble spots in their games and improve. For the last seven-plus years, the site has also hosted a popular MTT strategy podcast available for free to anyone, which, combined with other free content on the site, provides players a way to sample what TPE has to offer before subscribing. More than 30 pros are currently listed as contributors on the site, among them Casey Jarzabek, Ben Warrington, Andrew Brokos, Daryl Jace, Collin Moshman, Justin Ouimette, Mike Leah, Jamie Kerstetter, and Alexander Fitzgerald. The site has no signup fee and offers a free trial to newcomers. Those who choose to subscribe can do so for $39.95/month, $99.95/quarter, or $299.95/year. 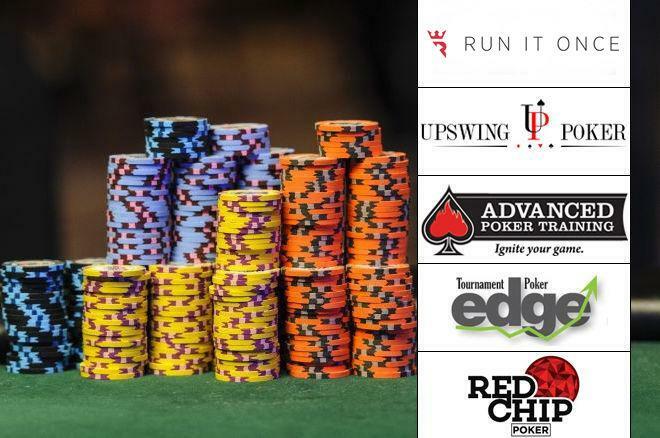 Started in 2013 by poker pros/coaches James Sweeney, Doug Hull, Ed Miller, and Christian Soto, Red Chip Poker offers players a variety of instruction in both cash games and tournaments. The full PRO membership ($50/month) offers a 7-day free trial and provides access to hundreds of training videos made by a variety of coaches, with new content created every week. PRO membership also includes unlimited access to the site's "Crash Courses" and "CORE" poker course, with those also available as options for players looking to spend a little less to get started. There's a "Live $1/$2 NL Crash Course" focusing on low-stakes cash games and another "MTT Crash Course" devoted to tournaments, each of which cost $39.95. Purchasers get unlimited access to training videos, podcasts, and articles on the chosen format (cash or tourneys), plus the ability to participate in the site's forum. Meanwhile, the "CORE" poker course represents a unique and inexpensive way for players to try out the site without spending much at all. The CORE course includes over 100 lessons covering everything from "basic building blocks" like value betting and pot odds to "advanced concepts" like triple-barreling and multi-street planning. CORE lessons vary in length, often containing a video plus exercises and quizzes with users able to earn "achievement badges" to mark their progress. The site estimates CORE contains around 75 hours' worth of study and costs $5 per week. As is the case with the other sites on this list, there is a lot of free content available over at Red Chip Poker as well, including videos, podcasts, and articles. Players are encouraged to check out each site and sample what it has to offer first before signing up.